HORSHAM, PA--(Marketwired - Jan 28, 2014) - For anyone conducting impact testing of materials, Tinius Olsen has boosted its already extensive range of capacities with an entirely new model pendulum impact tester capable of 800 joules of energy (800 ft.lb). The IT800 joins the IT 542 (542 J/400 ft.lb) and the IT406 (406 J/300 ft.lb) in delivering high energy impact testing, while fully complying with specifications outlined in ASTM E23, EN10045-2, and ISO 148. Tinius Olsen's new IT800 integrates a number of unique features, including a following arm that monitors the travel of its pendulum. 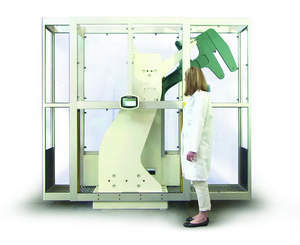 If the test area safety doors are open (or the optional light curtain is broken), the IT800 immediately stops any additional motion of the pendulum. This following arm also acts as the pendulum return carrier and safely returns it to its latched release point once the test is complete. Control of testing is achieved by a front-mounted touch screen display that facilitates set up and presents results in clear fashion. All Tinius Olsen high-energy impact testing machines equipped with digital displays can be linked to a stand-alone PC with an RS232 port and the company's Horizon software. Horizon offers user-selected reporting and exporting formats, built-in SPC programs for X-bar, R and frequency distribution charts and histograms, and separate modes for testing and recall. Across the range of Tinius Olsen pendulum impact testers are a variety of tooling options (easily interchangeable striking bits and a low blow fixture) for conducting Charpy, Izod, or tension impact tests, including at any of 55 velocity/energy levels from 5.47 m/s (17.9 ft/s) down to 0.13 m/s (0.4 ft/s). All Tinius Olsen models feature precision, friction-compensated, robust test frames and a range of safety features to ensure repetitive, secure testing. The IT800 is Tinius Olsen's newest pendulum impact tester, capable of delivering 800 joules of energy.